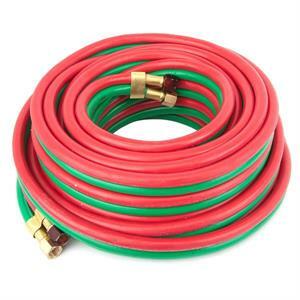 Forney 86146 Oxy-Acetylene Hose 1/4in. x 50ft. Home > Welding Equipment > Forney 86146 Oxy-Acetylene Hose 1/4in. x 50ft. Suitable for use with oxygen-acetylene only. 1/4" (6.35mm) x 50' (7.62m). Use with acetylene fuel gas only. Resists kinks, heat, weather and solvents. Bleed hoses when not in use for at least 30 minutes. Couple with one inch ferrules only.